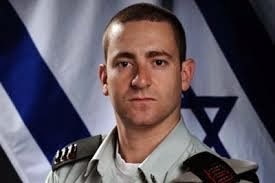 Former צה״ל (IDF) Spokesperson: Lobos for Israel will be hosting Barak Raz, who recently finished his five year service as the Israel Defense Forces’ main spokesperson. Captain Barak Raz has just completed two years as spokesperson for the Judea & Samaria Division of Israel Defense Forces Central Command. His previous positions in the Spokesperson's Unit include Head of North American Media Desk, Instructor and commander at the IDF School for Communication, and Foreign Press Branch Operations Officer. Raised in Queens, New York, Barak now lives in Tel Aviv, Israel. He earned an MA in Contemporary Middle Eastern Studies from Tel Aviv University (2011) and a BA in Political Science, Judaic Studies, and International Studies from SUNY-Binghamton University (2005). 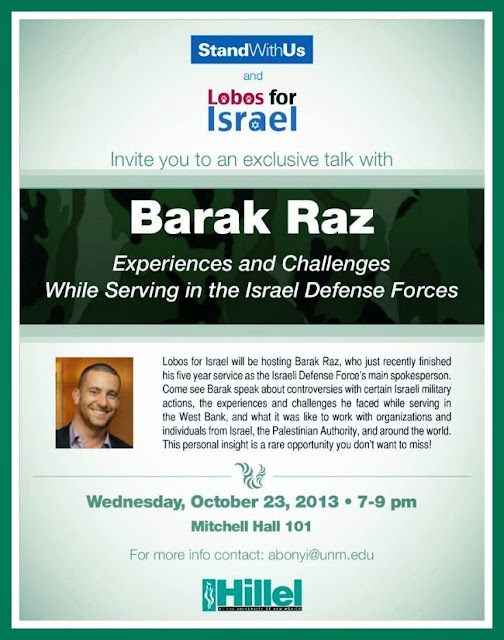 Come hear Barak speak about controversies with certain Israeli military actions, the experiences and challenges he faced while serving in the West Bank, and what it was like to work with organizations and individuals from Israel, the Palestinian Authority, and around the world. No perfect answers, in the Times of Israel. pro-Israel student group at the University of New Mexico.